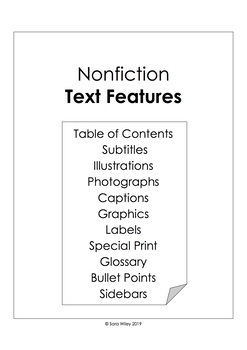 Nonfiction text features are essential to student comprehension of nonfiction text. When students preview a text and examine text features, they build scheme and recall prior knowledge in order to critically read the text. 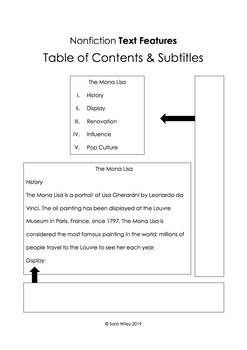 This set of student worksheets includes samples and descriptions of table of contents, subtitles, illustrations and photographs, captions, graphics, labels, special print, glossary, bullet points, and sidebars. In addition to the student worksheets, a teacher answer key for each worksheet is included.